New Liturgical Movement: What Teaches the Greatest Wisdom - Poetry, Prose or Beautiful Art and Music? What Teaches the Greatest Wisdom - Poetry, Prose or Beautiful Art and Music? An education in truths that cannot be expressed in words. I have just read the Love of Learning and the Desire for God, by Jean Leclerq. This provoked a number of thoughts. In it he describes various tensions playing out in education in the medieval period. One arises from the love of beautiful literature, poetic or prosaic, that is not explicitly sacred. The danger is that at some point the beauty of these works is so compelling that it hampers the spiritual development of the individual, because ‘Virgil might outshine Holy Scripture in the monk’s esteem because of the perfection of his style’. A properly ordered asceticism in this area consisted in a harmonization of sources and sometimes the more humbly written simple prose of divinely inspired Scripture is necessary for us so that we focus on the beauty of what it directs us to. The second tension that Leclercq describes relates to the study of logic, or sometimes called dialectic, which is another of the first three liberal arts that together comprise the trivium. As such it requires an understanding the technical language of logic. It is necessary in order to study philosophy and theology. The difference arose between two different sorts of school, the monastic and the town scholastic schools. The word scholastic is derived from the Latin word meaning ‘school’ and is applied to distinguish it from the monastic setting. One the one hand is the more traditional monastic school that is more literary, drawing on Biblical language and traditional literary forms. Those seeking to offer a Catholic education today are likely to draw on both the monastic and scholastic influences. 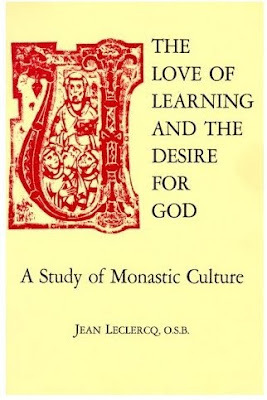 Even in the few Catholic ‘Great Books’ programmes that exist today we can see how a polarization might develop, some favouring either poetic knowledge on the one hand or of a formal Thomistic training on the other. This needn’t be so. As a general principle, I suggest, the way to avoid extremes of an over emphasis on the poetic form on one hand and an overemphasis on dialectic on the other is to make prayer and the liturgy the central, harmonizing principle of the life of the student and professor alike, whether monastic or scholastic. This is something more than encouraging participation in the liturgy. It is making the participation in the liturgy the guiding principle in what and how we learn and teach. The students should understand clearly how everything that they learn is done in order to deepen our participation in the liturgy. In this regard, the liturgy of the hours is a crucial presence on campus, I suggest. Then the praying of the liturgy will in turn illuminate the lessons learnt in the classroom. There are levels of understanding that cannot be said in words alone, even poetic words, that can only be communicated visually or through words when they are sung beautifully. Any lover of holy icons would say the same, I suggest, in regard to visual beauty. Giving ourselves a beautiful visual focus for our prayer, especially Out Lady, the suffering Christ and the face of Our Lord is important in this regard. Even then figures such as St Bernard himself warned of the dangers of visual beauty distracting from prayer, in a similar way to which warnings were made about poetic form. The question here is how is the image focusing us on prayer. Is it helping to stop distraction from external things, or is it itself a distraction from the beauty it points to. I suggest that this depends on the person and the art, but most of us, certainly I would put myself in this category, the greater danger is external distraction and sacred imagery is a profound help. Maybe at some future stage of my spiritual development I will feel like St Bernard.